His skies, whether pure or cloudy, gay or melancholic, resonate with the mysterious sounds of the universe. He forces the spirit to think and to soar above these magisterial representations . . . of reality . . . In front of this seductive painting, you have the impression of a full and benevolent life which makes you recall the intoxication one feels with the dawning of a new day. This week, I have been jammed by school responsibilities, but cannot take my mind off of painting. I got behind in my school work preparing for last week’s festival and now there is the devil to pay. I am hoping to be caught up by the end of tomorrow. The studio has been calling my name, and I have had to turn my back. But I cannot turn my back on thoughts of painting. At school the past two days, I have taken time between classes, over lunch, and during conference periods, to do some serious reading on French Impressionism and Post-Impressionism. My subjects have been Claude Monet and Paul Cézanne. The above quote I lifted from a nineteenth-century publication, loving the rhapsodic discussion of his clouds. 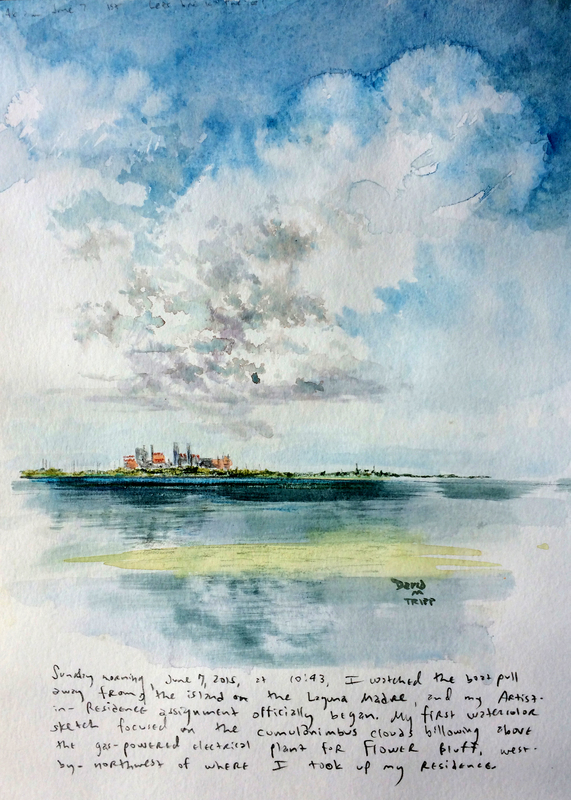 This brought to my memory the exhilaration I felt when I surveyed the cumulo-nimbus clouds that hung suspended all day every day over the island in the Laguna Madre where I stayed for a short while last June. Before those days, the only attempts I had ever made at rendering clouds were quick, slap-dash happy washes and blots on my watercolor paper. I was racing toward the main subject, which was always something in the foreground, and the sky was just a nuisance to get out of my way as quickly as possible. All of this changed with my arrival at the Laguna Madre, where I attempted my first “cloud portraits”, actually devoting the majority of my time on rendering the cloud formations I saw hanging in the sky. And once I returned to my home in Arlington, I continued to study the photos I took on location, making new attempts to paint these remarkable portraits. The artist-in-residence experience has changed me profoundly in many ways, and this is just one of them–my taking skies and clouds far more seriously in future paintings. I should like to astonish Paris with an apple. There is neither line nor modelling, there is only contrast. Once the colors are at their richest, the form will be at its fullest. Thank you, Claude and Paul, for being such kindred spirits, and for being such a comfort to me in this century. The greatest joy I know in painting is feeling this connection, this succession in a tradition of painters, all of us struggling to get nearer to our subjects. Dates Finalized for First Showing. Texas A&M University Corpus Christi will exhibit the first public showing of my original nineteen paintings and drawings in their university library October 12-31. There will be no formal opening reception for this one (the bigger show will happen next March), but I will visit the exhibit the weekend of October 17-18. I’m looking forward to seeing the framed pieces exhibited for the first time. 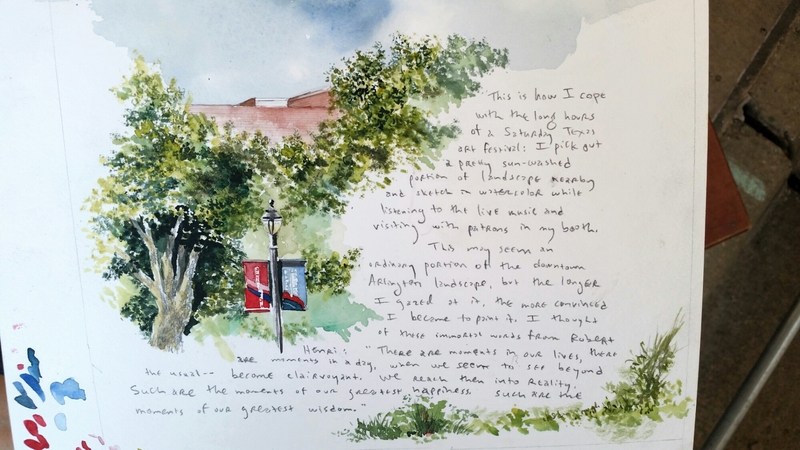 As I await sleep to overtake me, I’ve decided to post this plein air watercolor sketch I did last Saturday during my sojourn at the South Street Art Festival. 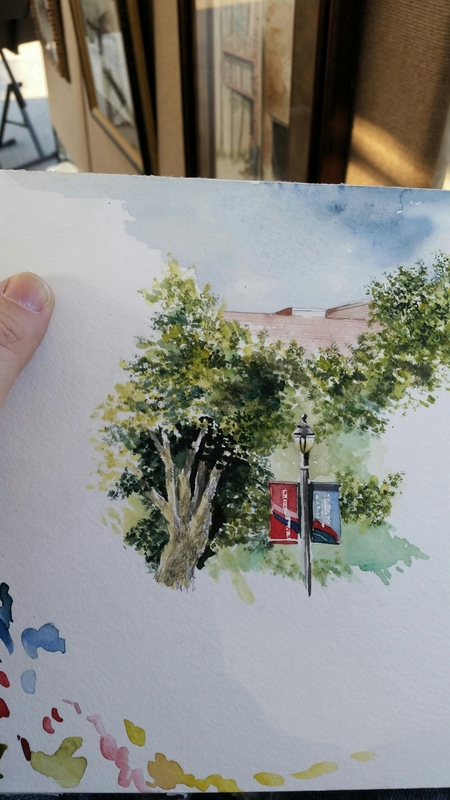 Sitting behind my booth, I had a good perspective of the foliage, streetlamp and city banners across the street. When I finished it, I did some journaling across the page, then put it up for sale. A patron purchased it that very evening. 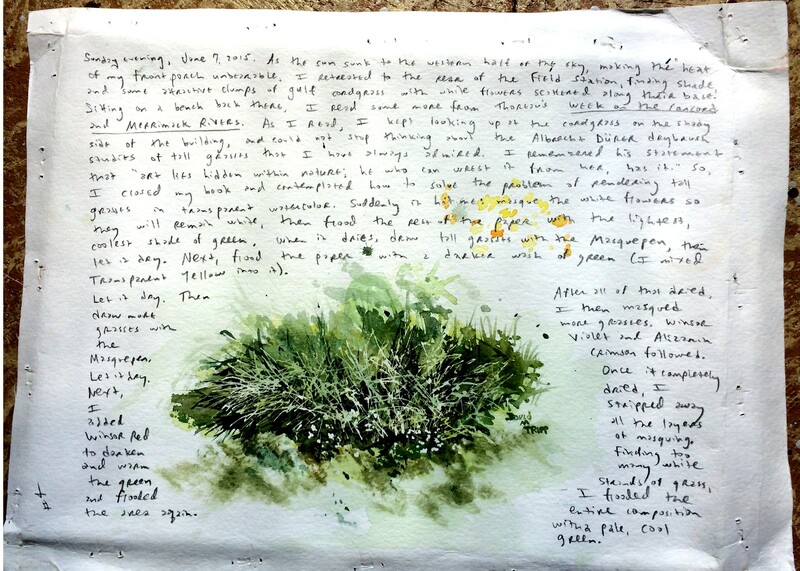 I am currently reading The Writer’s Eye: Field Notes and Watercolors by Paul Horgan. I love his illustrations and field notes, but don’t like that they are typed. My own handwriting leaves much to be desired, but I am determined now to clean it up and explore the possibilities of combining images and words in my artwork, as I’ve attempted recently. 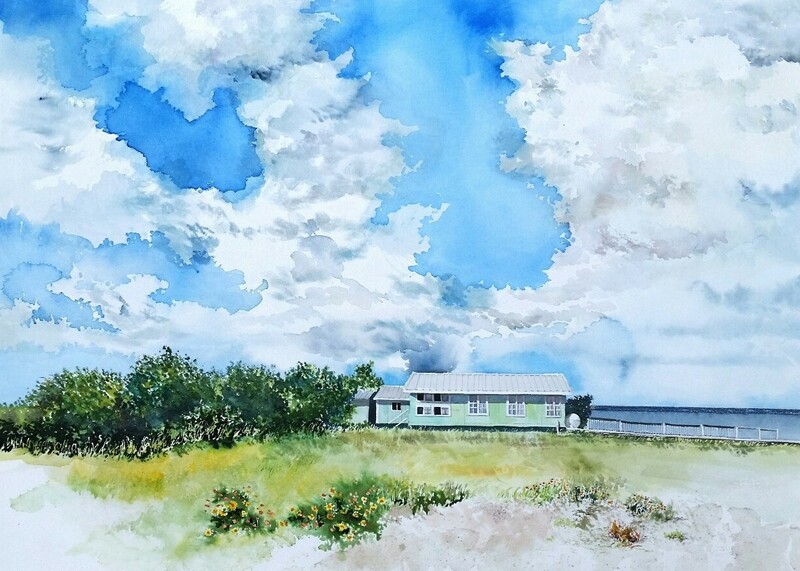 My one-man-show at the Texas A&M University Corpus Christi library has been set for October 12-31, and I believe it includes four watercolors and drawings of coastal subjects that contain pictures along with my handwritten journal texts. This is a direction I’m interested in exploring further. There’s a pervasive myth, shared by artists and non-artists alike, that art is a product of genius, madness or serendipity. Wrong. Art is not the chance offspring of some cosmic (or genetic) roll of the dice. Art is mostly a product of hard work. When you look back on the results of a lifetime of artmaking, even the role that talent played is insignificant. Living life productively, your artwork will take care of itself. If you do not live your life productively, nothing will save your artwork–not even talent. 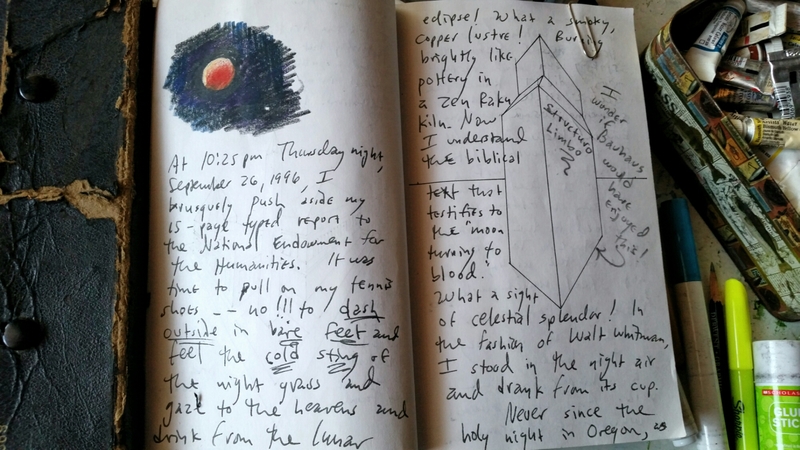 Last night, while watching the beautiful “super moon” eclipse, I realized I did not have a journal with me as I did on the night of September 26, 1996. I was so thrilled on that night, that I dashed back into my house, retrieved some prismacolor pencils and tried my best to render what I saw in the heavens that night. Last night, I just sat back in a lawn chair and enjoyed. I had just finished unloading my gear from a three-day art festival and was bone-tired, and though I knew I had to get up early today to return to school, I owed it to myself to sit and enjoy a phenomenon that won’t be around again for another eighteen years. Today I recall three days’ worth of conversations I enjoyed with art patrons at the South Street Art Festival. They often express amazement at the number of watercolor images I have hanging in my booth, along with trunks and crates filled with them. And they wonder how one person could produce so many paintings. 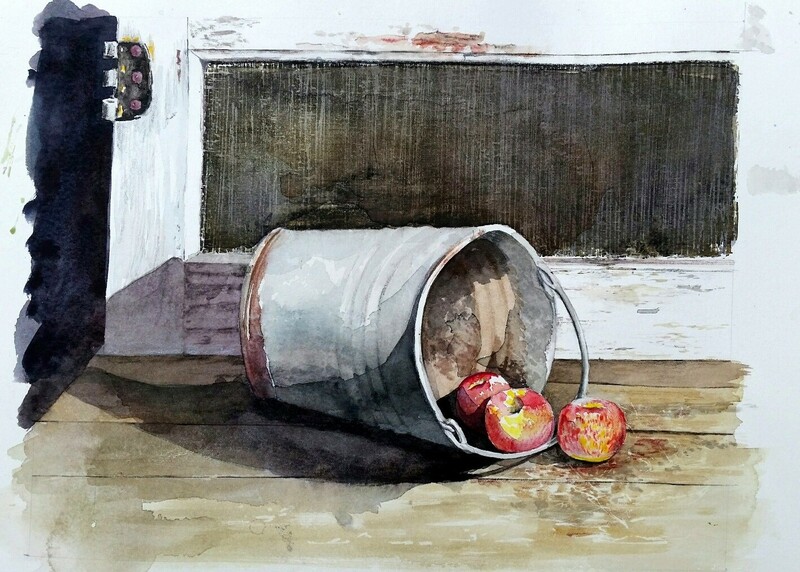 The answer to that is simple: watercolor requires very little time to complete a composition. And in addition to that, I have been watercoloring more seriously since 1999–sixteen years now. And in addition to that–for the past four years, my production has increased from ten-to-fifteen paintings per year to over a hundred. That adds up to a large body of work. Unfortunately my art doesn’t sell fast enough to clean out my inventory, so the paintings accumulate. I appreciate it when someone tells me I have talent, but the reality is that I work hard to produce. And I’m hard on myself regarding self-critique. I want to improve. My deep-set belief is that anyone devoting hours, days, weeks, months, and years to doing a task is going to improve significantly as time moves on. Malcolm Gladwell, in his celebrated book Outliers, has made the argument that successful people have dedicated 10,000 hours to maturing their craft. I like that general rule. And as for my own work, I would rather look at one of my paintings from 2015 than 1999. The major difference is the number of hours’ experience I have piled up as the years unrolled. If I have any regrets now, it is the reality that I stopped making art from 1976 to about 1988, and I often wonder how my work would look now if there were not that hiatus from that past. No regrets actually–It was during those years that I was deeply immersed in graduate study, and I still believe that my ideas and experiences matured during those “silent” years. Day two of the South Street Festival is amazing. 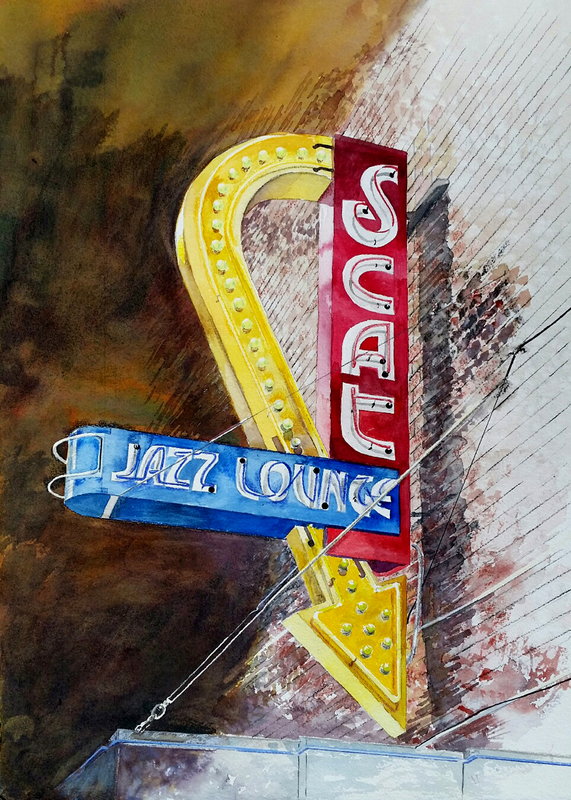 As I write this, Texas Flood (a Stevie Ray Vaughn tribute band) is tearing up the crowd, and I’m sketching in watercolor a collection of trees and lamppost across the street from my booth, as I listen to the live music and interact with patrons drifting in and out of my booth. 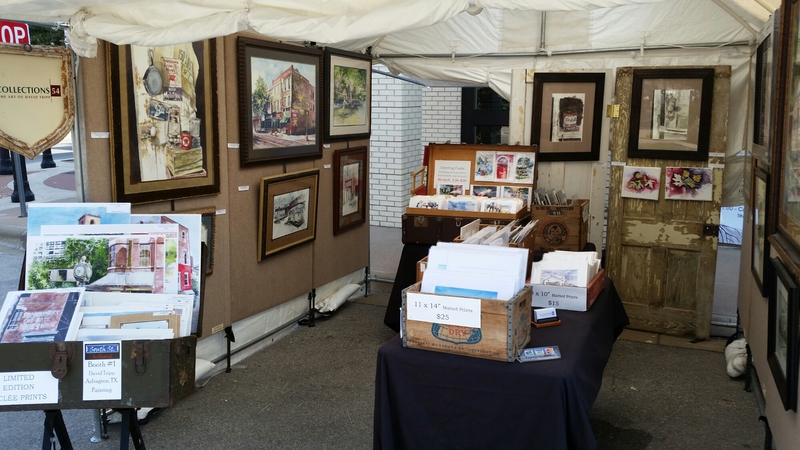 It was a hot sunny day for setting up, but I’m glad now to have three days to relax in my art booth and enjoy meeting the festival patrons. There are times like now when I have to laugh at the juxtaposition of ideas wafting through my consciousness while doing mindless tasks like printing, matting, shrinkwrapping and processing for an art festival to begin in less than twenty-four hours. Andy Warhol named his studio “The Factory” because he ran it like a production line, with his silkscreen images lined up across the floor and a number of hired workers assisting him in pulling them. Tonight I put an old VHS tape of “Neil Young Unplugged” into a small portable TV that has been a good companion in my man cave throughout recent years. Listening to him pound on his acoustic guitar while I snapped tape, lined edges, and matted prints, I felt a kinship between the two artists and myself. The only difference is that I am alone in the studio tonight, but quite content. I’m satisfied with the quiet solitude and space as I work, not needing the Pop musician or Pop artist’s adoring audiences. And I don’t feel lonely. I’m loving the sense of camaraderie that I feel as I listen to Neil, think about Andy’s legacy, and feel gratitude that tomorrow I get to enter the festival arena for three days, sit in my booth, and enjoy whatever conversations may transpire with patrons as they drift through the festival atmosphere. I’m starting to tire, and paused to rest and blog before making one final run at production before calling it a night. Tomorrow, early, I will load the Jeep, drive to the festival site, and begin setting up for a 4:00 opening. Browsing through some of my old portfolios this afternoon, I was shocked to pull out this unfinished watercolor that I abandoned long ago and completely forgot. I decided to go ahead and photograph it as is and make an 8 x 10″ print from it, along with some greeting cards. 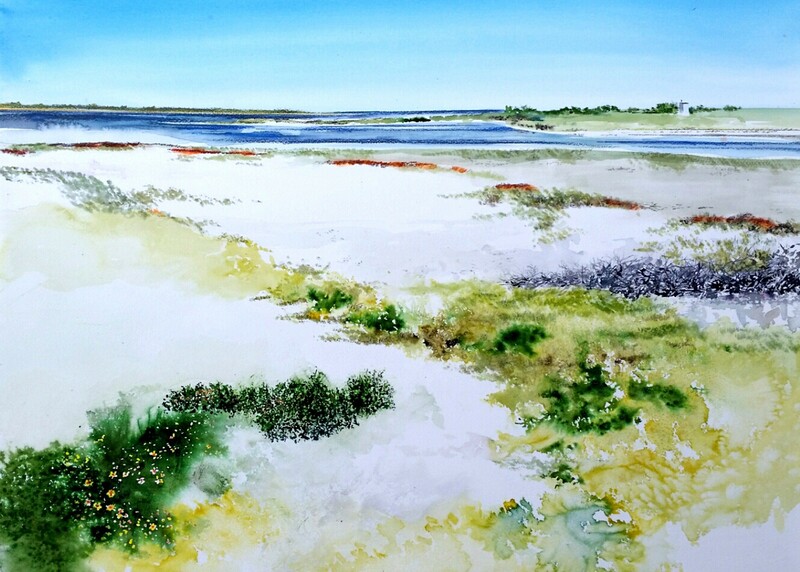 In addition to over twenty new images from the Laguna Madre I painted and drew this summer, I will add this to the “debut” section of my booth. This one I also pulled from the portfolio with surprise. I wonder if getting old means that you forget things you once spent a great deal of time on and then put away for awhile. I also made a print and a selection of greeting cards from this. 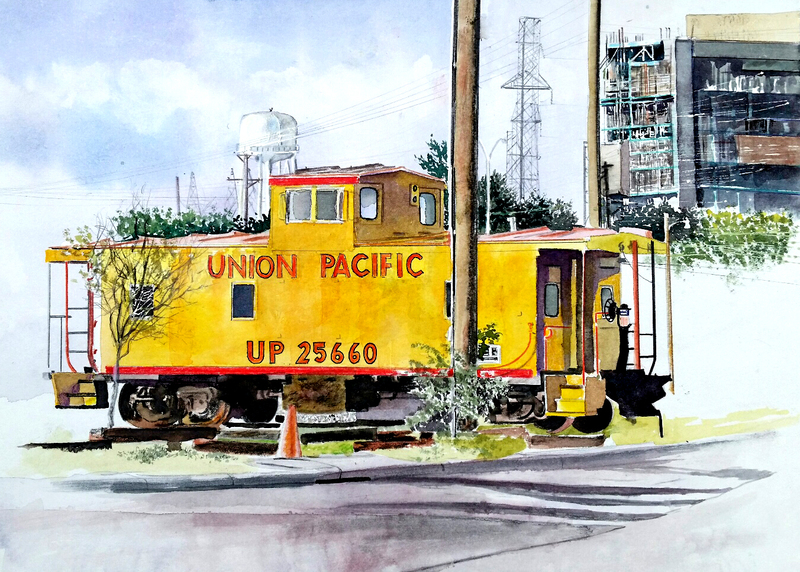 Another surprise from the portfolio was this Union Pacific caboose I painted near a power plant in the old historic Handley Neighborhood in east Fort Worth, near Arlington where I live. 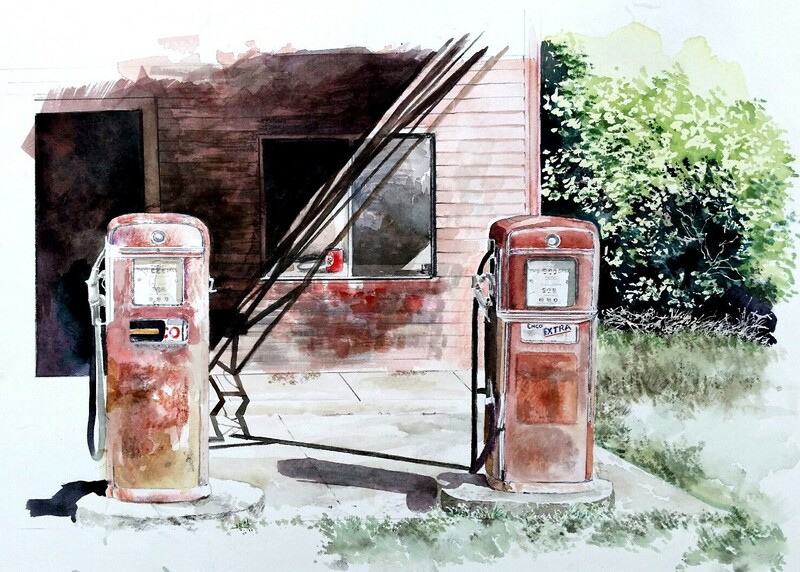 And finally, this pair of abandoned gas pumps in Lexington, Texas. This is the second time I painted these, but put them away in my portfolio and forgot about them. I’m pleased to be able to share some new work in this weekend’s venue. Beauty in art reminds one what is worthwhile. The combination of school responsibilities, outside social appointments and organizing my inventory for the weekend’s art festival should be grinding me into the ground. But actually, I am feeling energized. I’m not sure if it is the cool pre-dawn temperatures hovering around the low 70s (unfortunately they’re forgotten by afternoon–yesterday climbed up into the mid-90’s! 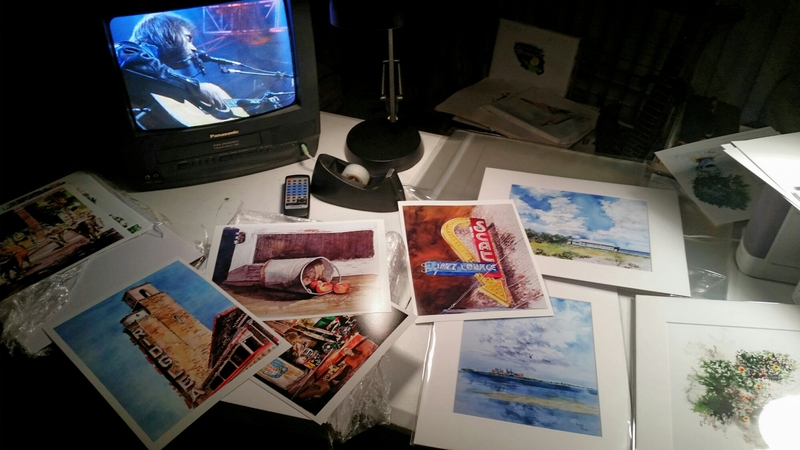 ), or if it is the sight of my new greeting cards and prints coming into view. Whatever it is, I’m glad to feel so alive this week, anticipating the show. 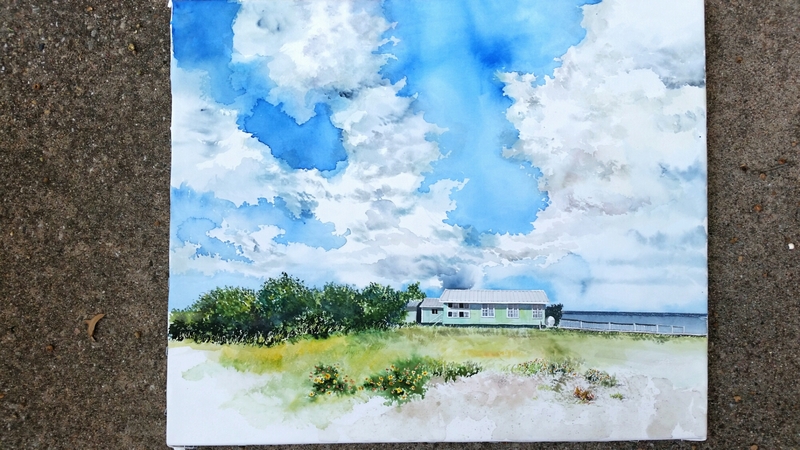 I have already printed out scores of Laguna Madre images of my paintings and drawings created over the past three months, formatting them for 5 x 7″ greeting cards that I sell with envelopes and plastic sleeves for $5 each, or 5 for $25. I’m also creating 8 x 10″ images to place in 11 x 14″ white mats, backing and plastic sleeves for $25 each. After months of painting and drawing, I am finally feeling excited about getting this work out into public view. For the first time, I have also formatted my combination journals and watercolor sketches to fit 5 x 7″ cards. I’m not sure I should be writing this, but I was so upset when Office Depot merged with Office Max, discontinuing their card stock and envelopes product. I had used them faithfully for years. Now, I discover that Hallmark Cards creates a much superior product for about 30% less the cost. I now chafe that I did not explore options sooner, but am pleased now to see the quality of my greeting cards and envelopes far exceeding what I used to produce. For any of you creating greeting cards of your own, consider Hallmark. The fall season is approaching, but Texas doesn’t yet know it. Yesterday afternoon we reached 95 degrees. Disgusting. At any rate, the arrival of fall means the revival of art festivals (Texas cannot host them during the triple-digit summer months). I now have to find another gear and kick into a higher speed to get my inventory together for this weekend’s three-day run. I will be taking my show to Arlington Texas’s South Street Art Festival on 100 W. South St., Arlington 76010. This is a free event featuring live musical performances and original art. We will open at 4:00 on Friday, and my work will be in Booth #1. 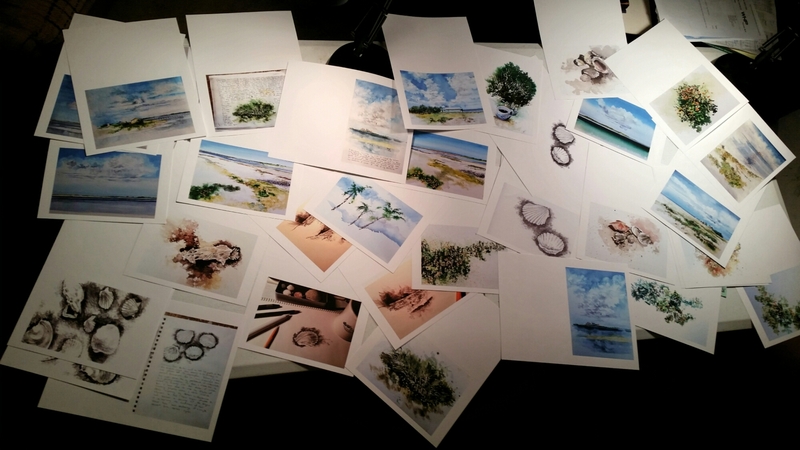 For the first time, I will be bringing out greeting cards and matted 8 x 10″ prints of my entire Laguna Madre collection–over thirty new pieces not brought into the public eye before. 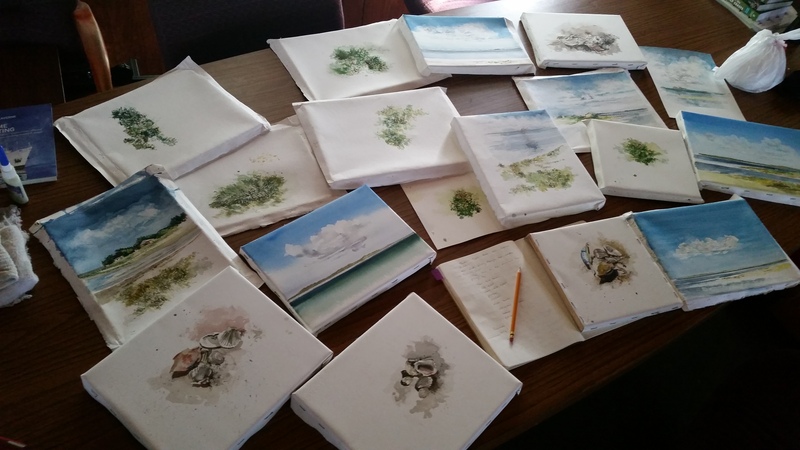 These pieces are subjects I sketched and painting throughout my week as Artist-in-Residence on an island in the Texas Laguna Madre, compliments of Texas A&M University Corpus Christi. 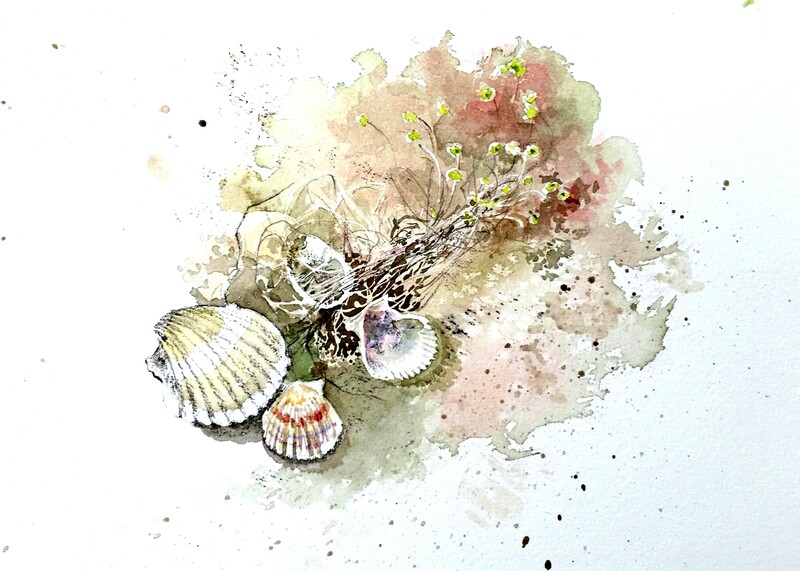 Over the past three months, I have continued to make new paintings and drawings of these remarkable surroundings. As soon as I get home from school later today, I’ll go to work in the Factory, and will begin posting images of my new work going on display and sale.